This section will give an understanding of the basics behind a successful breeding program. Temperament is also referred to as docility. It relates to how an animal reacts to stress. Temperament can increase production costs and injury risks or it can improve productivity, performance and manageability. Beef CRC results show “A conservative difference of $80 to $100 per head by selecting good feedlot performers based on temperament”. Over 78 days, nervous group steers grew at 1.04kg/day, while calm steers grew at 1.46kg/day. British breeds (Bos taurus) have production characteristics which differentiate them from European (Bos taurus) and Brahman (Bos indicus) genotypes, and which confer a competitive advantage to them when used in either purebreeding or crossbreeding production system, particularly in temperate environments. Primary (cow-calf) selection regimes for British breeds have traditionally been pasture based which has resulted in selection of animals reflecting high efficiency of feed conversion, high fertility, docility, moderate size and medium physiological maturity – prerequisites for easy finishing ability and highly acceptable meat quality. Recent selection regimes in some countries has focused selection on an extended growth curve, performance under feedlot conditions and improved carcase performance. The blending of traditional and recent selection regimes now provides a genotype with a wide range of within breed/genotype variation for all major production traits. British breeds are uniquely positioned to target pure or crossbreeding systems, for light through to heavy weight carcases finished on either pasture of grain. No other genotype has this range of abilities. This advantage is becoming more significant as markets move towards value based marketing and the end consumer is having a greater influence in determining the outcome of breeding programs. Preliminary results from Australia’s Cooperative Research Centre (CRC) in Meat Quality clearly demonstrate significant consumer benefit from British breeds. Using a composite scoring system (MQ4 score) that included tenderness, juiciness, flavour and overall eating quality acceptability; peak force and marbling (IMF%), British breed sired calves ranked higher than European, Brahman or Brahman derived sire breeds. Australian Herefords have contributed significantly to the above results and have demonstrated superiority in terms of yearling growth, and yield to their Angus and Shorthorn counterparts. Early results from the Cooperative Research Centre in Meat Quality at Armidale also demonstrate superior net feed conversion efficiency in favour of the Hereford. Feeding cattle is the single, largest variable expense in commercial beef production. Profitability depends on costs and revenue. Hereford cattle can decrease feed requirements and improve feed utilisation to reshape profitability and sustainability for farmers. What does it mean for the producer? Whiteface Cattle Consume Less Feed – Their daily feed intake is 1.2kg/day less than Angus cattle. Whiteface Cattle Maintain Growth & Gain – They consume 6% less feed for the same gain as Angus cattle. Whiteface Cattle Save You $$$$ And Time – Less feed, means less inputs, means less cost. It takes an extra 61 tonnes of feed annually for a 100-cow Angus herd compared to a 100-cow Hereford herd. Practical farmers have always known that Herefords have the genetic potential to improve a herd’s feed intake and feed utilisation. Now science has proven it. Latest industry research, reveals that Hereford is the number one British breed when it comes to net feed intake (NFI). Conducted by the Cooperative Research Centre for Cattle and Beef Quality (Beef CRC), with collected data analysed by the Animal Genetics and Breeding Unit (AGBU) at the University of New England, Armidale, the research reveals Herefords are ahead of their Angus and Shorthorn competitors with significantly lower NFI. 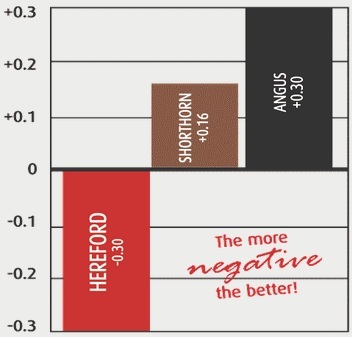 Simply, Hereford-sired progeny consumed significantly less feed daily, without sacrificing growth and gain.